Summary: A new study reveals women with increased facial contrast are often perceived at being younger. A French research team, in collaboration with American researchers, have discovered one such aspect of aging — facial contrast. “Facial contrast refers to how much the eyes, lips and eyebrows stand out in the face in terms of how light or dark they are or how colorful they are,” says Aurélie Porcheron, a researcher involved in the study. Facial contrast decreases with age in women around the world. This example includes French Caucasian, Chinese Asian, Latin American and South-African women. Younger women are in the top row.NeuroscienceNews.com image is credited to Aurélie Porcheron. Funding: Chanel PB funded this study. Image Source: NeuroscienceNews.com image is credited to Aurélie Porcheron. Frontiers “Women Seen as Younger When Eyes, Lips and Eyebrows Stand Out.” NeuroscienceNews. NeuroscienceNews, 11 October 2017. Frontiers “Women Seen as Younger When Eyes, Lips and Eyebrows Stand Out.” http://neurosciencenews.com/facial-features-women-younger-7725/ (accessed October 11, 2017). Age is a fundamental social dimension and a youthful appearance is of importance for many individuals, perhaps because it is a relevant predictor of aspects of health, facial attractiveness and general well-being. We recently showed that facial contrast—the color and luminance difference between facial features and the surrounding skin—is age-related and a cue to age perception of Caucasian women. Specifically, aspects of facial contrast decrease with age in Caucasian women, and Caucasian female faces with higher contrast look younger (Porcheron et al., 2013). Here we investigated faces of other ethnic groups and raters of other cultures to see whether facial contrast is a cross-cultural youth-related attribute. Using large sets of full face color photographs of Chinese, Latin American and black South African women aged 20–80, we measured the luminance and color contrast between the facial features (the eyes, the lips, and the brows) and the surrounding skin. Most aspects of facial contrast that were previously found to decrease with age in Caucasian women were also found to decrease with age in the other ethnic groups. Though the overall pattern of changes with age was common to all women, there were also some differences between the groups. 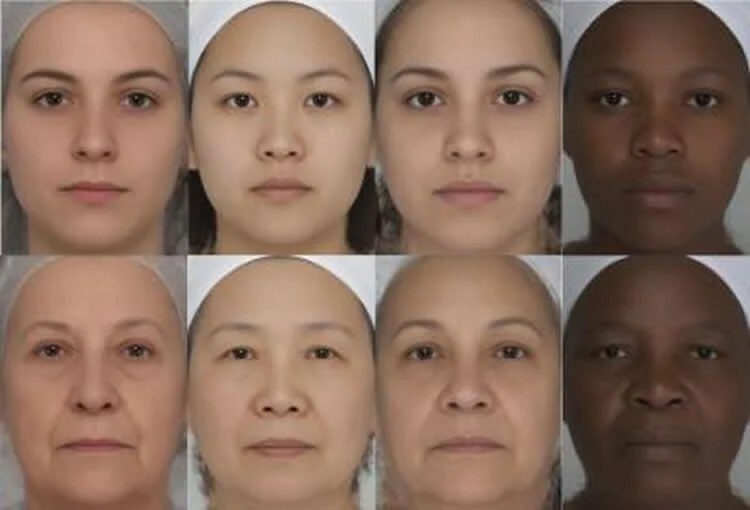 In a separate study, individual faces of the 4 ethnic groups were perceived younger by French and Chinese participants when the aspects of facial contrast that vary with age in the majority of faces were artificially increased, but older when they were artificially decreased. Altogether these findings indicate that facial contrast is a cross-cultural cue to youthfulness. Because cosmetics were shown to enhance facial contrast, this work provides some support for the notion that a universal function of cosmetics is to make female faces look younger.